In the first comprehensive treatment of the role of churches in the processes that led to the American Civil War, C.C. Goen suggests that when Presbyterian, Methodist, and Baptist churches divided along lines of North and South in the antebellum controversy over slavery, they severed an important bond of national union. The forebodings of church leaders and other contemporary observers about the probability of disastrous political consequences were well-founded. The denominational schisms, as irreversible steps along the nation's tortuous course to violence, were both portent and catalyst to the imminent national tragedy. Caught in a quagmire of conflicting purposes, church leadership failed and Christian community broke down, presaging in a scenario of secession and conflict the impending crisis of the Union. As the churches chose sides over the supremely transcendent moral issue of slavery, so did the nation. Professor Goen, an eminent historian of American religion, does not seek in these pages the “causes” of the Civil War. Rather, he establishes evangelical Christianity as “a major bond of national unity” in antebellum America. 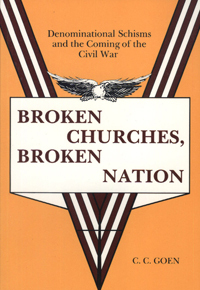 His careful analysis and critical interpretation demonstrate that antebellum American churches-committed to institutional growth, swayed by sectional interests, and silent about racial prejudice-could neither contain nor redirect the awesome forces of national dissension. Their failure sealed the nation's fate.